An important aspect of the ESIP community is recognizing the outstanding accomplishments, achievements and service of our community members and individual participants. ESIP gives the following awards each year. Catalyst Award: This award honors participants who have brought about positive change in ESIP and inspired other members to take action. Charles Falkenberg Award: The Charles S. Falkenberg Award is given annually to one honoree in “recognition of an early- to middle-career scientist who has contributed to the quality of life, economic opportunities and stewardship of the planet through the use of Earth science information and to the public awareness of the importance of understanding our planet.” Established in 2002 and jointly sponsored with the American Geophysical Union (AGU), the Falkenberg Award is named in honor of Charles S. Falkenberg, whose research focused on enabling practical applications of Earth science through data visualization and information technology. ESIP Partner of the Year: This award honors an ESIP partner organization that best exemplifies the spirit of ESIP in one or more areas. 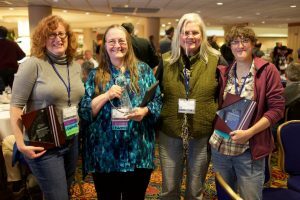 Martha Maiden Award: This award, named for Martha E. Maiden, Program Executive for Earth Science Data Systems at NASA, honors individuals who have demonstrated leadership, dedication and a collaborative spirit in advancing the field of Earth science information. President's Award: This award recognizes a participant who has made significant contributions to ESIP during the previous year; the recipient is selected by the current ESIP President.